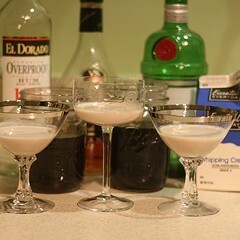 Creme de cacao isn't just dated—it's all but defunct as a serious cocktail ingredient. Usually found on the bottom shelf, stuck between other sickly sweet liqueurs, it ranks right up there with Sour Apple Pucker and Boone's Farm in the hierarchy of respectable booze. I'm pretty sure I had it in college, where it featured in classics like the Peppermint Patty (creme de cacao with peppermint schnapps or creme de menthe). 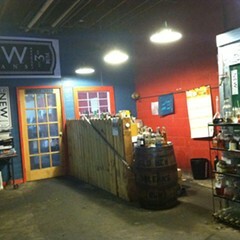 The site webtender.com lists nearly 200 cocktails with creme de cacao, most with names like Almond Joy or Banana Cream Pie, featuring ingredients like amaretto, banana liqueur, Bailey's, blue curacao, butterscotch schnapps, and Kahlua. It seems to be one of those liqueurs aimed at people who want to get drunk but hate the taste of alcohol. A couple months ago, though, I came across the Mixellany website, which has digital versions of lots of classic cocktail books (the collection is currently in the process of moving to a new site, and is temporarily unavailable). The first one I started flipping through was a Cuban book of cocktails from the 1930s, and as I started scanning recipes I realized that quite a few of them featured creme de cacao. I wasn't even sure what that was, so I looked it up and found that it's just chocolate, sugar, and alcohol (there's no dairy; the "creme" refers to the viscosity of the liqueur, which is created by lots and lots of sugar). I also came across an excellent article by Kenzi Wilbur in Punch exploring the history of creme de cacao. In the mid-19th century, according to Wilbur, creme de cacao was meant to be consumed on its own. 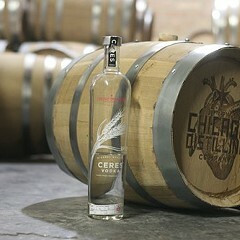 As cocktail culture developed in the 20th century, spirits like whiskey and gin came to the forefront, liqueurs were relegated to mixers, and productions standards for things like creme de cacao dropped. "Viscous like a batch of triple-strength simple syrup and just as sweet, the creme de cacaos of the 20th century barreled toward dessert territory and didn't look back," she writes. "And unless the date on your arm ordered a Grasshopper at a bar during the disco days, there wasn't a compelling reason to be in its company. To the back of the liquor cabinet, and to the bottom shelves it went. Until now." Wilbur believes that the chocolate liqueur is slowly rising from the dead. 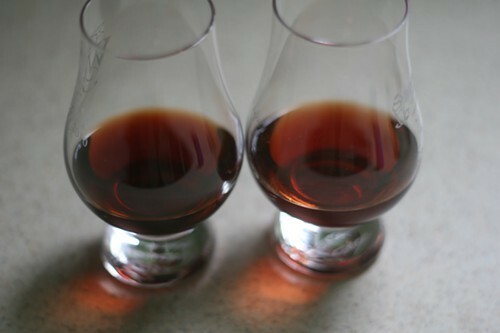 As evidence, she cites several examples of bars in New York and Portland, Oregon, that are using creme de cacao in cocktails or even making their own version of the liqueur. I'm not sure the renaissance has hit the midwest yet—if it has, I haven't noticed—but I figured I could experiment with making the liqueur myself. You could probably start with cheaper vodka, but I had this on hand and wasn't going to do anything else with it. 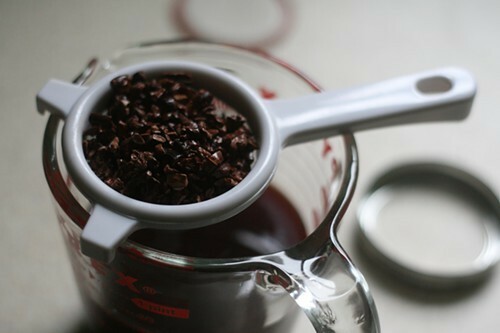 I looked up recipes and narrowed it down to three—from Serious Eats, the Drink Blog, and Punch—all using cacao nibs (other options include cocoa powder or chocolate extract). 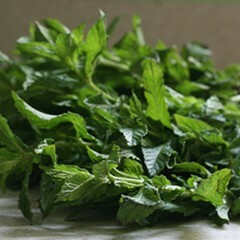 I usually trust Serious Eats recipes, but after comparing their version to a similar one at the Drink Blog and realizing the former had more than six times as much sugar, I decided to skip it. 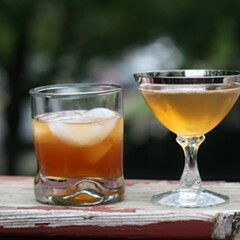 Instead I settled on the Drink Blog recipe and one from Portland, Oregon's Teardrop Lounge (part of the Punch article) that uses high-proof demerara rum instead of the vodka called for in the first two recipes I'd seen—and only half as much sugar as the Drink Blog one. The recipe from the Drink Blog has to sit for two weeks, so I started with that one, which I modified a little. For one thing, it calls for 1.5 liters of vodka. I didn't want anywhere near that much creme de cacao, so I quartered the recipe. I also used 80-proof vodka instead of 100-proof because it's what I had on hand (and one of the notes on the recipe says that 80 proof is fine to use), and skipped the vanilla beans because I wanted to compare the flavors of the two liqueurs without vanilla distracting me. Also, I didn't have vanilla beans. 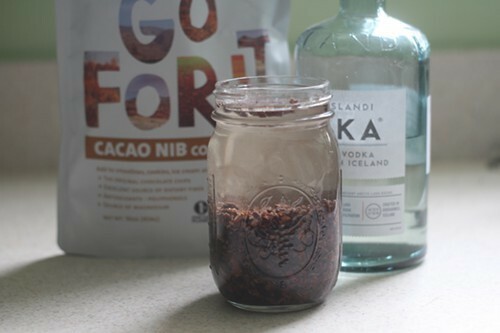 It's pretty straightforward: you just combine cacao nibs with vodka in a jar and let it sit for two weeks, shaking every day or two, then pour it through a coffee filter to strain out the cocoa butter. 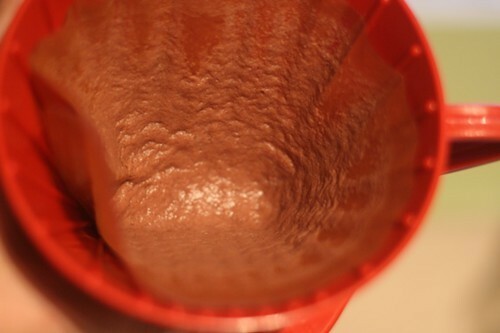 (It's easier if you use a sieve to remove the nibs first). 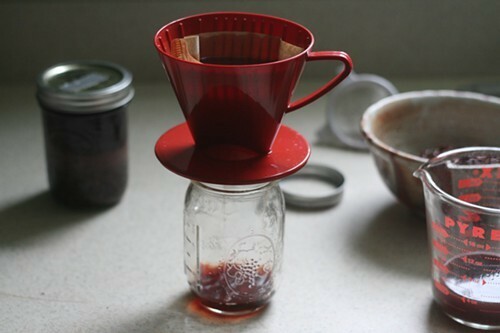 Make simple syrup, let it cool, and add it to the strained liquid; after it's rested for a day or two it's ready to drink. A week later, I made the Teardrop Lounge recipe, which only needs a week before it's ready (because it uses higher-proof alcohol, it doesn't need to sit for as long). 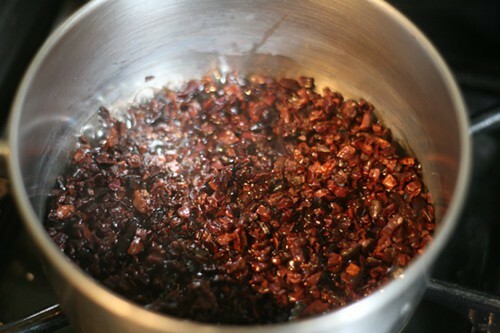 Instead of adding the sugar at the end, you make a simple syrup in which you caramelize the cacao nibs (this part smells amazing), cool them on a parchment-lined baking sheet and then combine them with the demerara rum. 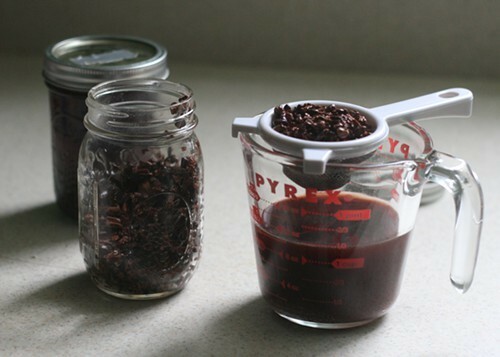 This recipe calls for a bottle of rum, so I thought I'd halve it—but then I realized you're only supposed to use half the caramelized cacao nibs, reserving the rest for a future batch. I wasn't sure I'd be making future batches, so I quartered the amounts for that part of the recipe. Also, the recipe specifies Lemonhart 151 rum, but the liquor store I visited was out of it, so I bought El Dorado instead, which is also 151-proof demerara rum but costs less. After it sits in the jar for a week, you're supposed to strain it through cheesecloth and dilute it with equal parts water to lower the proof. I used a coffee filter instead of cheesecloth and left it at full proof for reasons I'll get into below. 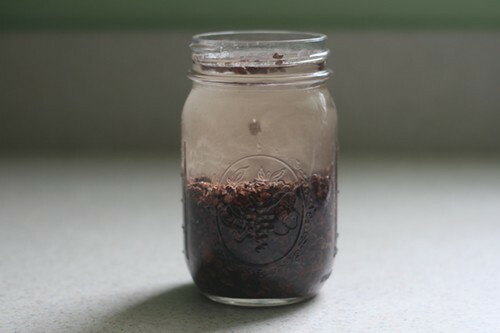 The Drink Blog notes that after a few days, you'll notice a white cloudiness in the jar, which is the cocoa butter. 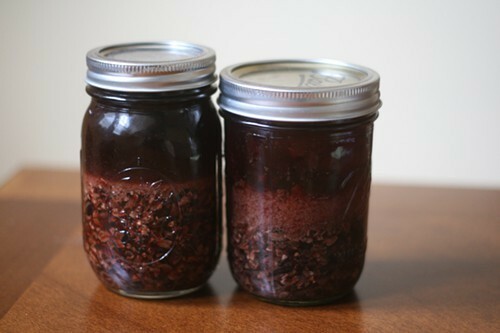 I could see the cocoa butter in both recipes, but there was a lot more in the Teardrop version, presumably because of the higher alcohol content; the Drink Blog recipe actually uses more nibs (you can see the cocoa butter in the photo above). 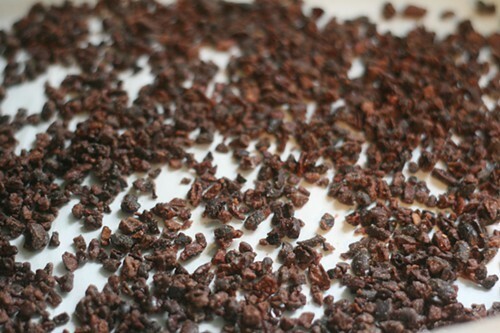 If more cocoa butter extraction equaled better chocolate flavor, though, I couldn't tell. I expected to like the version with demerara rum better, because the more alcohol spirits have, the better they are at extracting flavor—plus, rum has more flavor than vodka to start with. I was wrong. The creme de cacao with the vodka base had a velvety dark-chocolate flavor with just enough sweetness and barely any alcoholic burn. While it was very rich and full in flavor, it wasn't heavy at all. I think it's best over ice, but I could drink it at room temperature too. I left the demerara rum version of the creme de cacao at full strength in the jar, afraid that diluting it one to one with water as the recipe recommended would water it down too much. That turned out to be a good idea; I diluted it with the recommended amount of water in the glass and ended up with a thin-tasting, watery creme de cacao. Trying it straight wasn't any better; its alcohol content was so high that it burned like crazy and I couldn't taste anything but the alcohol. Adding a little cream helped (I used about a third as much cream as liqueur), and I picked up some caramel flavor in addition to the chocolate, but it was still pretty hot. 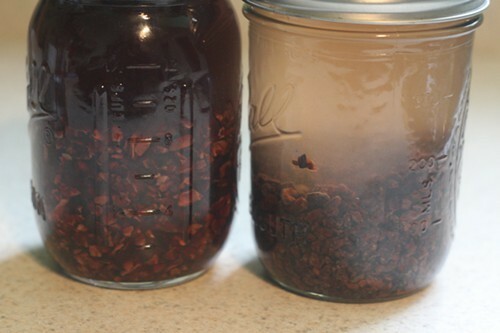 If I make creme de cacao again, I'll probably try it with 80- or 100-proof rum (for added flavor), using the same proportions and method as the Teardrop Lounge recipe but letting the infusion sit for at least two weeks to make up for the lower proof. I'll use the smaller amount of sugar in the Teardrop recipe; while I liked the sweetness of the Drink Blog recipe I think it might be even better with less sugar. 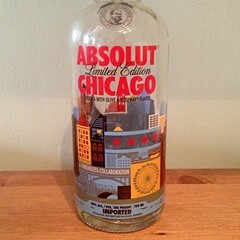 And I'm really glad that I avoided the Serious Eats version, which uses more sugar than vodka. I can't even imagine how tooth-achingly sweet that must taste.